For the first I am going to write a review for I am choosing a film that is not only fairly new out on Blu - Ray but it’s one onthe most recent films I have seen. superstar Mr Robert De Niro, The film is based on the 1991 novel The Feather Men by Sir Ranulph Fiennes, and is directed by Gary McKendry. 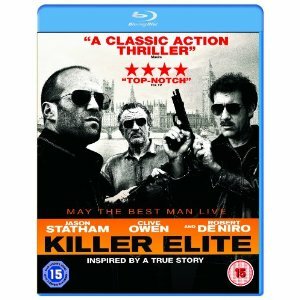 Based on a true story, Killer Elite pits two of the worlds' most elite operatives - Danny, an ex-special ops agent (Jason Statham) and Hunter, his long-time mentor (Robert De Niro) - against the cunning leader of a secret military society ('Clive Owen'). Covering the globe from Australia to Paris, London and the Middle East, Danny and Hunter are plunged into a highly dangerous game of cat and mouse - where the predators become the prey. The film is just under 2 hours long, well 1 hour 40 mins to be precise but at know point do you loose interest in the movie as the action is typical with Statham movies fast, furious and at times violent which is not such a bad thing if your a big action movie fan, lets put it this way i wouldn't advise this movie if your planning to smooze a chick unless she's abit rough round the edged. Killer Elite is a cracking movie even if you’re not a fan of Statham or Owen who both do excel in this movie then just the appearance of De Niro makes this film a must see for all action movie fans young & old (certified 15). There is also some good performances from the beautiful Australian actress Yvonne Strahovski who plays Stathams 's love interest Anne & there is also a good performance from the Wallasey born Australian actor Dominic Percell who is probably most famous for his role as Lincoln Burrows.